To earn CEUs for this article, become a member. Editor’s note: This text-based course is a transcript of the webinar, Lymphedema Management of the Orthopedic Patient, presented by Jan Bruckner, PT, Ph.D., CLT-LANA. The participant will be able to describe at least three ways the anatomy and physiology of a normal human lymphatic system function to control swelling and remove metabolic waste. The participant will be able to list two ways to identify swelling caused by infection from lymphedema. The participant will be able to describe at least three ways lymphedema management techniques can help reduce swelling, reduce pain and increase range of motion in patients with orthopedic problems. Given a case study of a patient with an orthopedic problem, the participant will be able to outline an appropriate therapy program including a problem, at least two short-term goals, at least two long-term goals, and at least two interventions. In addition, we're going to discuss program planning, including looking at problems, setting short-term and long-term goals, and appropriate treatment plans. To put the whole package together, I have assembled a series of case studies that are going to illustrate how you can apply these concepts to your patients in the clinic. Lymphedema is swelling resulting from a buildup of lymph: a fluid that is a combination of water, bacteria, and metabolic waste produced by the body's cells. Because lymph fluid has metabolic waste in it, if you have an excessive amount of lymph in any area, it causes inflammation in the surrounding tissues. If untreated, it can exacerbate the problem and lead to infection. As such, it's important that we keep track of our patients and that we control the swelling so we don't end up with inflammation and infection. A buildup of lymph fluid and lymphedema will delay the healing process. Furthermore, it will increase pain, and you're going to see a decrease in your patient's active range of motion (AROM), active assistive range of motion (AAROM), and passive range of motion (PROM). You're also going to see that they have a decrease in function. There are many articles that have addressed this issue of lymphedema management of orthopedic conditions. Unfortunately, none of these articles had statistically significant results. Furthermore, these studies all had small patient populations, and they had problems with the research design. While people are definitely researching this issue and publishing literature on the topic, we don't have solid evidence to show that there are statistically significant results that lymphedema management actually improves outcomes with orthopedic patients. I call your attention to the second reference on this list, which was conducted by Cohen in 2011. Now, this is a little bit different than the other case studies because Cohen was dealing with a patient who had an ankle displacement fracture and treated it with an open reduction, internal fixation. The patient was treated at another facility, and four months after the surgery developed lymphedema. Cohen was a lymphedema therapist with certification in lymphedema management and was treating this patient specifically for lymphedema. They achieved a very good result with this patient. The patient had improved gait, returned to a normal level of function, had decreased swelling, and was independent in the home exercise program. In contrast, however, this chronic case in Cohen's study is a little different than the acute cases that we will review later in the presentation, where we're looking at lymphedema as part of the healing process. From my own clinical experiences, toward the end of the presentation, I'm going to show you cases of patients that had a total hip replacement, a total knee replacement, carpal tunnel syndrome repair, trigger finger repair, and an elbow debridement. The lymphatic system has been known since the 1600s. Aselli wrote about mesenteric lymphatics in 1622, and Rudbeck and Bartholinus published work on the lymphatic system in the 1650s. In 1787, Mascagni published a definitive monograph about human lymphatic anatomy. In 1933, Drinker and Field wrote a description of lymphatic physiology. However, even though this lymphatic history and information existed, when I was in PT school, no one taught me anything about it, let alone how to integrate this knowledge with the treatment of my orthopedic patients. Clearly, this shows that we have a long way to go before we're putting all the pieces of our patients together to have a coherent plan of how to get them back functioning and doing what they would like to do. As a review, let's look at the lymphatic system anatomy. All mammals, including humans, have two different circulatory systems: the blood circulatory system and the lymphatic circulatory system. The blood circulatory system has the heart to pump blood, and the blood cells circulate. The heart pumps the deoxygenated blood to the lungs; there's exchange; the blood cells get oxygenated, and they pump back to the heart. The heart pumps and it goes through the arterial system to the body cells at the capillary level; there's exchange where the oxygen, vitamins, minerals, other materials that the cells need pass out of the blood circulatory system into the body cells; when they're fully depleted of oxygen, they enter into the venous system; the heart pumps and they go back to the heart, and the whole system repeats itself. The lymphatic circulatory system is a component of the immune system. Unlike the blood circulatory system, the lymphatic system only goes one way. It has no pump, it has no heart. Since it doesn't have a heart, we can use the diaphragm in lieu of a heart, because the main thoracic duct goes right to the diaphragm. If we teach our patients diaphragmatic breathing, then we can use the diaphragm to pump the fluid (which we will discuss later in the presentation). Why does the lymphatic system go only one way? Lymph contains metabolic waste, such as bacteria and cancer cells. The body needs to get rid of this waste, so it's a one-way system. As an analogy, it's like a garbage disposal. You want the garbage to go out of the house through the disposal. You don't want it to circulate it and have the garbage come back in when you turn on the faucet. Similarly, we want to eliminate the metabolic waste from the body. Figure 1 shows a schematic picture comparing the blood and lymphatic circulatory systems. 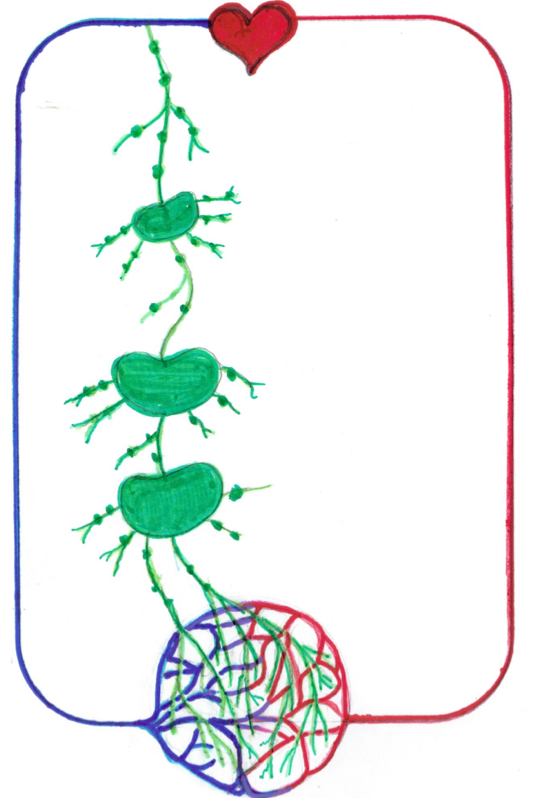 The blood circulatory system is represented in blue and red; the lymphatic system is represented in green. At the top of the picture is the heart. I didn't draw in the lungs, but the lungs are on either side of the heart. That's where we're going to get the blood cells oxygenated. Along the red pathway on the right side, the arterial system brings the oxygenated blood wherever it needs to go, and it then ends up in the capillary system (represented by the diagram at the bottom of Figure 1). On the right side of the capillary system, we're starting to see an exchange of oxygen, nutrients, minerals, other substances, out of the arterial system into the body cells; eventually, the cells are depleted of their nutrients and all of the oxygen is exchanged. Along the left side of Figure 1 is the venous system (the blue pathway); it's going back up to the heart, and the whole cycle repeats again. Figure 1. Schematic comparison of blood and lymphatic circulatory systems. The lymphatic circulatory system is in green; the kidney-shaped globules are lymph nodes, which we all have in various sizes. At the level of the capillaries, the metabolic waste that was produced by the body cells gets dumped right outside the wall of the body cell. The lymphatic system has lymph collectors that draw in this metabolic waste that draws in the lymph fluid. Then, it's going to send it through these little lymph vessels, and each time it passes through a lymph node, we're going to get a certain amount of purification. Lymph will exit through a larger vessel, go through another lymph node resulting in more purification, all the way through until we get purified fluid that's ready to go back into the circulatory system. Jan Bruckner, PT, PhD, CLT-LANA, has been a physical therapist for forty years with an academic background in anthropology, philosophy, physical therapy, and lymphology. While working for United Cerebral Palsy, she learned about the horrific abuses that occurred at Willowbrook State School. Her reaction led her to a six-week National Endowment for the Humanities summer symposium on allied health ethics and doctoral studies where she wrote a theory of physical therapy ethics for her PhD minor. She taught in academic physical therapy programs, did research and worked as a clinician. She served as a physical therapist in the US Peace Corps and consulted to both the US Indian Health Service and the Canadian First Nations Health Service. She provided pro bono services to the US Army in Indianapolis, IN during Desert Storm, to people in Les Cayes, Haiti after the 2010 earthquake, and in a shelter for men who are homeless in Philadelphia, PA. The case studies in her ethics seminar draw on her experiences in these varied settings. This three-hour course examines ways to use lymphatic therapy techniques to manage patients with orthopedic problems, such as joints replacements, fractures, sprains, and strains. Topics include: anatomy and physiology of the human lymphatic system, techniques, such as manual lymphatic drainage, compression, elevation, diaphragmatic breathing, therapeutic exercise, kinesiotaping, and skin care, program planning, including problems, short term goals, long term goals, and treatment plan, and case studies to illustrate the application of the material presented. This course is directly related to the practice of physical therapy and is therefore appropriate for the PT and PTA. Editor's Note: Regarding Pennsylvania credits, this course is approved by the PA State Board of Physical Therapy for 2 hours of general and 1 hour of Direct Access CE credit. PTs and PTAs in the state of GA are required to complete a 4 hour course on jurisprudence and ethics for license renewal. This course reviews the jurisprudence and ethics components as outlined by the Georgia Board of Physical Therapy and is applicable for PTs and PTAs licensed in the state of Georgia. This three-hour online course has been developed to meet the mandated ethics requirement for physical therapist and physical therapist assistant re-licensure. The course discusses the ethics documents developed by the American Physical Therapy Association (APTA), including the Code of Ethics, the Standards of Ethical Conduct for the Physical Therapist Assistant, the guides for professional conduct, and other relevant papers available at http://www.apta.org/EthicsProfessionalism/. A problem-solving model will be used to apply the APTA ethics concepts to 10 case studies that have been chosen to reflect potential problems that clinicians may face. The course ends with resources available for individuals desiring to pursue further inquiry. This course will present best practices in management of hypertrophic scarring, as well as methods used to synthesize best available evidence into practical recommendations at the point of care. These methods can be applied to all areas of practice. This course is directly related to the practice of physical therapy is therefore appropriate for Physical Therapists and Physical Therapist Assistants. This course will discuss basic wound care definitions, concepts, and treatments. Participants will be able to identify wound types based on clinical presentation, suggest appropriate dressings and treatments, and understand when a referral to an outside specialist is warranted. This course is directly related to the practice of physical therapy and therefore appropriate for the PT and PTA. Editor's Note: Regarding Pennsylvania credits, this course is approved by the PA State Board of Physical Therapy for 2 hours of general CE credit from 7/15/2017-12/31/2018.